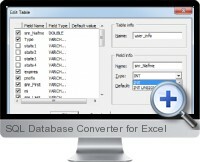 SQL Database Converter for Excel converts Microsoft Excel spreadsheets into Microsoft SQL or MySQL database formats. The programs support all versions of MS Excel and can convert CSV files into database tables or convert MS SQL or MySQL database tables into MS Excel spreadsheets. Windows 2000/XP or higher with Internet Explorer 5 or later. At least 32 MB of available memory. For conversion from databases: MS SQL environment (server or client components of MS SQL should be installed on the same machine where you run MS SQL-to-Excel from) or necessary privileges to read the source database on MySQL server.